Love this time of year ! 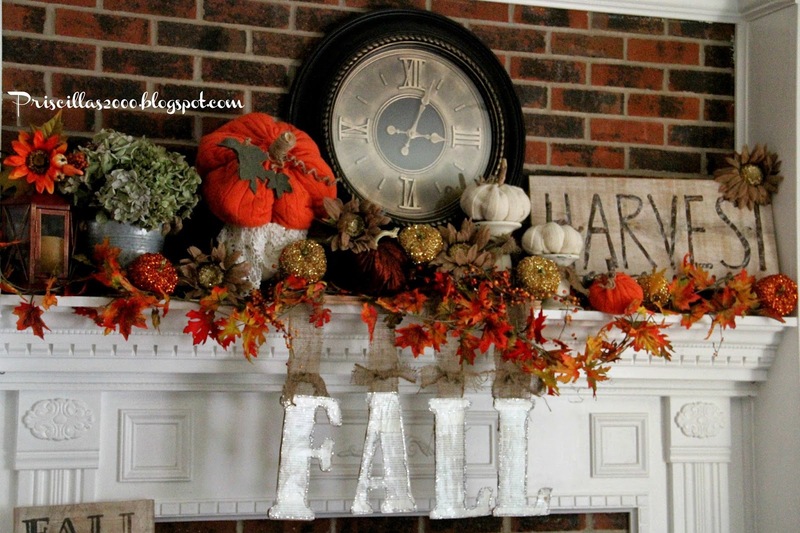 Fall is in the air in our home ! I made this Fall bookpage banner last year , I wasn't going to use it again but it still looked good so up it went! I used alot of the sweater pumpkins I made the past two years from thrift store sweaters, and the Harvest sign I just freehanded on an old board. A galvanized bucket of hydrangeas from the yard, glitter pumpkins from Walmart ,berry garlands and leaf garlands. I think I got the burlap glittered sunflowers at Hobby Lobby last year on clearance. 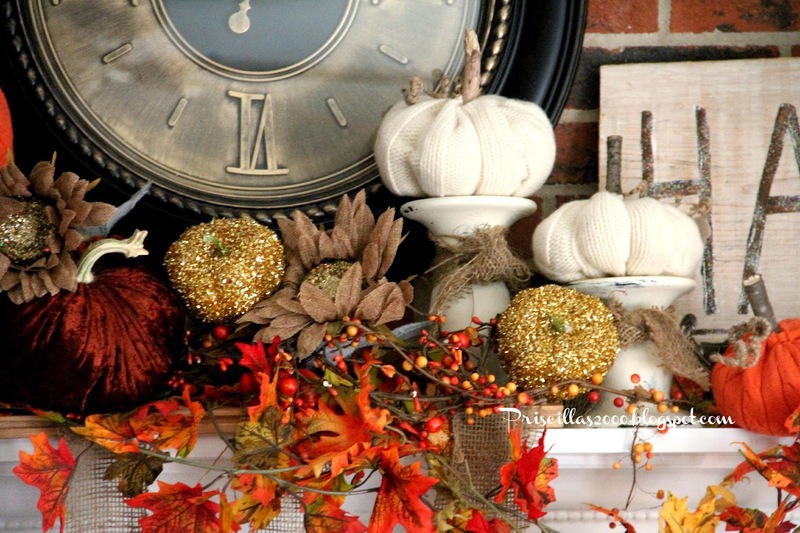 I love the sparkle of the glittery sunflowers and pumpkins..with the rustic boards and bucket. I will be back with more Fall in our home tomorrow ! Thanks so much for stopping by ! I would love for you to follow me on Instagram, Facebook and Pinterest ..all the links are in the sidebar ! Linking to these fabulous parties ! Love ur blog! Such great ideas! I want your mantle! It's very warm and inviting. 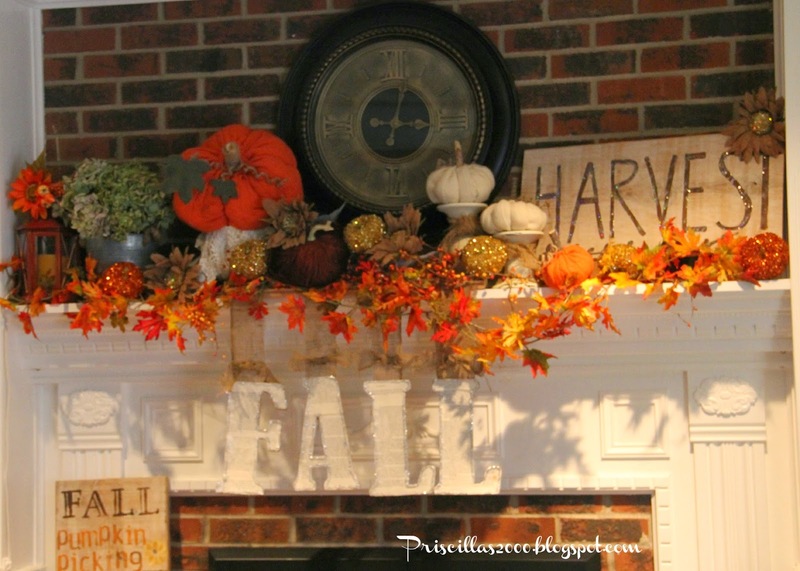 Your Fall mantle is gorgeous. I love the book page banner. I may just have to attempt to make one and also the Harvest sign. Beautiful work on your mantle. I love your mantle, it looks so pretty. I wished I had one in my home. Looks so warm and inviting Priscilla! I need to try out some of those sweater pumpkins. I am beginning to do my Fall decorating too. My favorite time of the year! 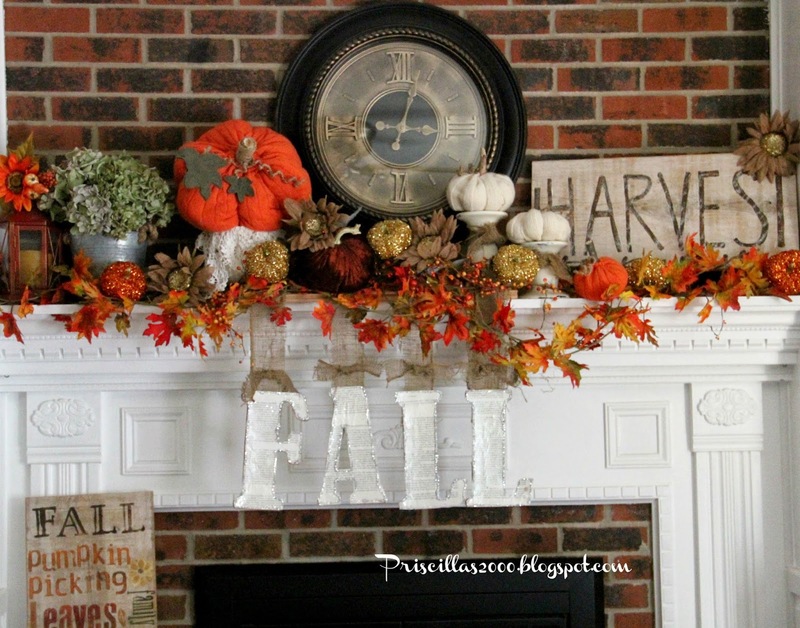 Priscalla, your beautiful Fall Mantle caught my eye at the That DIY Party. Makes me want to go sit by the fire with a good book and some apple cidar! It is snowing here today so that would be quite fitting. Snowing in September - crazy! 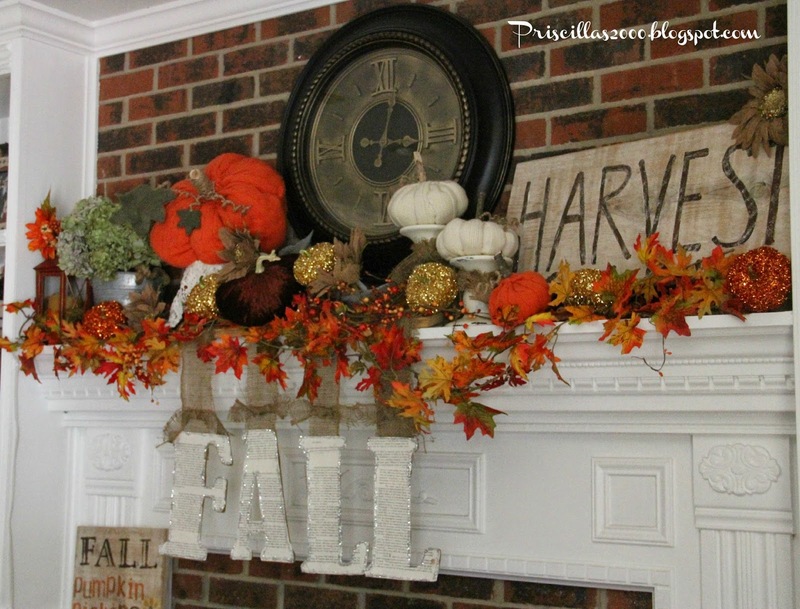 Your mantel looks so cute! So festive and fun!! 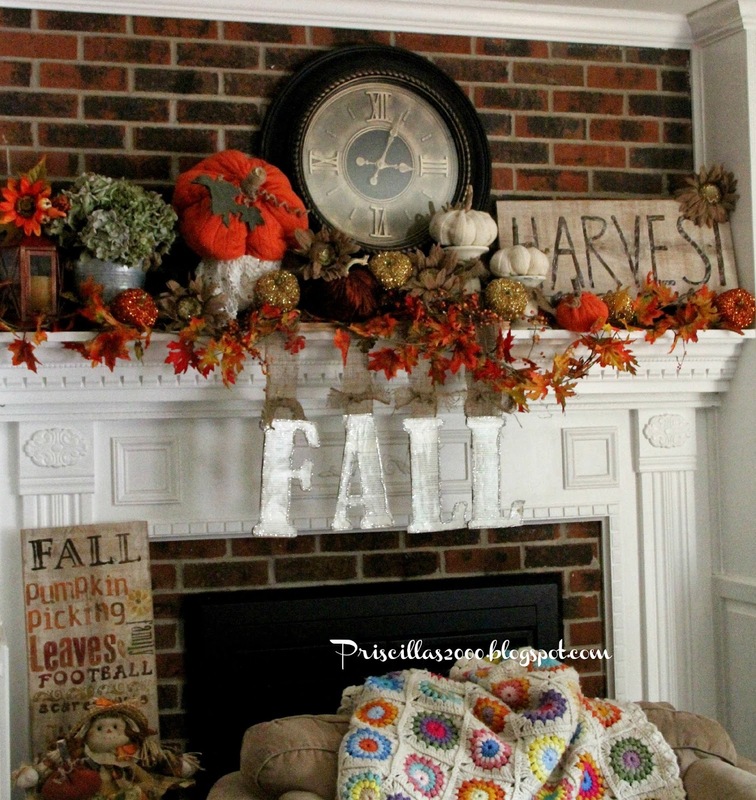 I love your Mantle for this coming fall..
Love the sweater pumpkins!! Great vignette!! It's beautiful Priscilla! I ended up using the same banner I made last year for my mantle also. It just seemed to work. Thanks for sharing with SYC. I miss having a mantle. 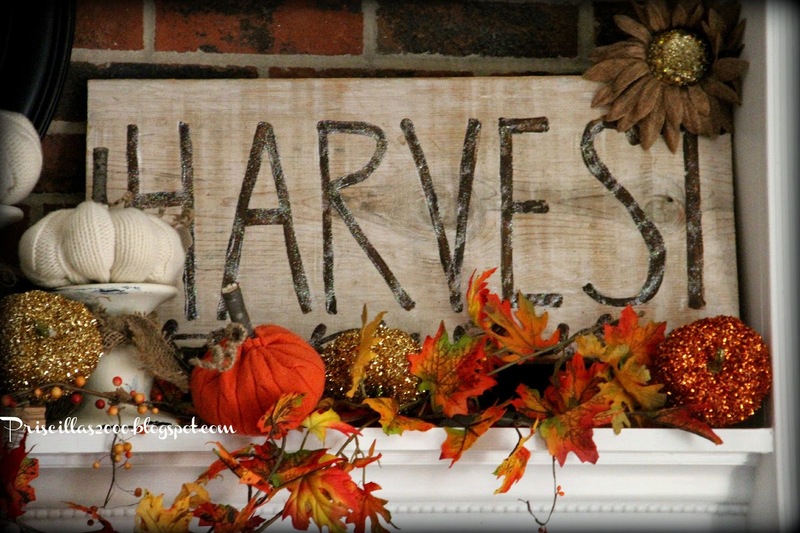 Love the Harvest sign.